Morning everyone! 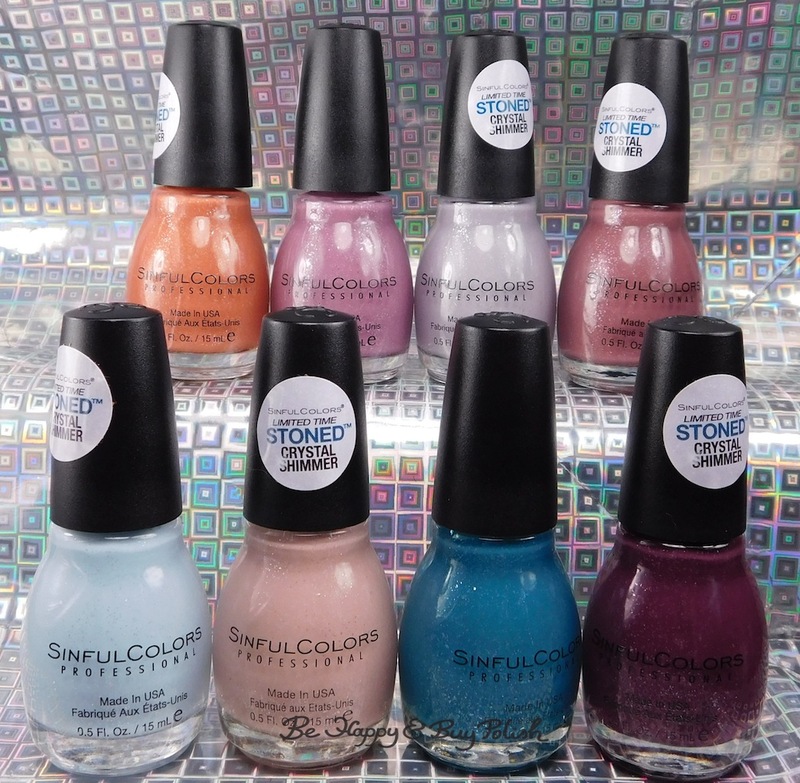 I’m so happy to finally be showing you this collection from Sinful Colors called the Desert Divas with the Stoned Crystal Shimmer finish. I have the whole collection, save for Super Cooper which is on its way to me (courtesy of a lovely lady in the Sinfully Polished Nails group on fb). When I receive that polish, I’ll be sure to update this post! All of these have the same silvery flakie in them, as well as a slight teeny pink sparkle. Update: Read all the way to the end to see Super Cooper! Up first is 2217 Better Sedona-Ed, a pale blue based polish. Formula is thin and meh on self-leveling. This is 2 coats and no top coat. 2218 Just Deserts is a pink neutral polish. (Remember it from this nail art?) Formula is thin, again meh on self-leveling. This is 2 coats and no top coat. 2219 Tealing Power is a teal based polish. Formula has a better consistency than the previous two, and was a good at self-leveling. It is a stainer though! This is 2 coats and no top coat. 2220 Namaste the Night is a deep purple based polish. Formula was back to being thin and so so on self-leveling. This is 2 coats and no top coat. 2221 Clay Me is an orange with a tinge of pink polish. Formula was thin but self-leveled well. This is 2 coats and no top coat. 2222 Desert Reign is a lighter mauve purple polish. This was of good consistency and self-leveled nicely. This is 2 coats and no top coat. 2223 Thera-Pewter is a grey-purple polish. Formula was thin but self-leveled nicely. This is 2 coats and no top coat. 2223 Gotta Terra Cotta is a ruddy polish. Formula was thin and so-so on self-leveling. This is 2 coats and no top coat. 2225 Super Cooper is a dusty green polish. This had a great formula and self-leveled well. This is 2 coats and no top coat. My favorites? I’ve gotta say Just Deserts, Desert Reign, Thera-Pewter, Gotta Terra Cotta, and Namaste the Night. And now Super Cooper! What do you think your favorite is? Some nice new polishes from Sinful Colors. So pretty! Thera-Pewter is just as pretty as I’d thought it would on the nails! I”m also digging Gotta Terra Cotta and Desert Reign. They are all just such classy colors. Totally on point! Better Sedona-Ed and Just Deserts reind me of the Ilamasqua polishes, one was blue/gray called Raindrops an the other was pink an I* forget what it was called. Similar look with tone-on-tone semi-chunky glitter. Very pretty! These have such a cool finish! I’m loving Super Cooper!